Wrinkles are the result of aging of your skin and the movement of the facial muscles. This process can be accelerated by the sun and smoking. If you are young, your skin will recover easily, but with age the first lines become visible. These lines then develop into wrinkles. With Botox we can soften these wrinkles or make them even completely disappear. In addition to reducing wrinkles, Botox is also used for spastic muscles, squint and migraine. Botox is also used for excessive perspiration and teeth grinding. Botox is injected under your skin and is relatively painless. The result achieved is usually clear after a week and remains visible for 3 to 4 months. To guarantee you a professional treatment we only work with specialized doctors. The result of a professional treatment looks beautiful and natural. During your consultation with the doctor we discuss your wishes and the expected result. Our goal is to give you a realistic picture of the possibilities and the effect that Botox can bring to you. Aging differs from person to person, but sooner or later everyone will develop wrinkles. Wrinkles are the results of aging skin and movement of facial muscles. Sun exposure and smoking are important aggravating factors in the aging and wrinkle formation of skin. Protection from the sun and not smoking will not prevent aging, but, will prevent acceleration. Wrinkles of the frown area, forehead and crow feet are the result of contraction of the underlying muscles. After every facial movement a crease will be visible in the skin. In young people these creases will recover due to sufficient elasticity in the skin. Through the years the first facial lines will become visible and, in the years thereafter, they will develop into wrinkles. By selectively paralyzing facial muscles with Botox many of these wrinkles will soften or disappear. If you start at an early age (after 18) and regularly undergo a Botox treatment you can prevent these wrinkles from developing. Since the 90’s Botox has been used extensively for cosmetic purposes. This treatment became immediately popular amongst top models who required to remain wrinkle free. Botox is a brand name for botulinum toxin A, and was the first brand that was approved for cosmetic purposes. In the meantime, many different brands produce Botox. Botulinum toxin is a protein produced by the bacteria Clostridium Botulinum. This protein blocks the transmission of electrical impulses of the nerve to the muscle, resulting in temporary paralysis of the muscle. It also blocks the transmission between nerves and sweat glands. For many years Botox has been used for medical and cosmetic purposes. Botox therefore is not a filler but blocks muscle activity and glands. Besides the use of treating wrinkles of the face, there are many implications for the use of Botox e.g. spasticity of muscle in the arms, hands and neck. Botox can also be useful in the treatment of spastic bladder, spasms of muscles around the eyes and squint eyes or migraine. Also, for depression a positive effect has been measured after the use of Botox treatment of facial wrinkles. After injecting Botox under the skin in the axilla, a significant reduction of sweating is to be expected for 4 to 6 months. Also, teeth grinding can be reduced by weakening the masticatory muscles. The most popular cosmetic use of Botox is the treatment of frown, forehead and crowfeet wrinkles. Through selectively paralyzing specific muscles in the face, changes/improvements can be made in the position and shape of the eyebrow, the bunny lines, the ‘gummy smile”, the corner of the mouth, dimples in the chin and bands in the neck. During your first consultation your wishes and the different options to realize these wishes will be discussed. It is important to have realistic expectations of the treatment. Therefore, during your consultation, the possibilities for a Botox treatment for you will be explained. Botox will be injected subcutaneously with a thin needle into selected muscles. The exact location of the injection will be analyzed accurately beforehand and marked. Although the injections will be sensitive, in general they are not experienced as painful and an anesthetic is not required. An effective way to ease the discomfort of the injections is to cool the skin just prior to the injection being given. A treatment with Botox is quick and, in most cases, lasts 5 minutes. Botox is a “lunch break” treatment. At the injection sites some swelling and redness will appear that will subside within 30 minutes. You will be able to continue immediately with your daily activities. It is very important not to apply any pressure on the injection sites and not to go and lie down in the next 4 hours. It is also not advisable to do any sports that day or go to the sauna to prevent spreading the Botox by wiping sweat from the forehead. 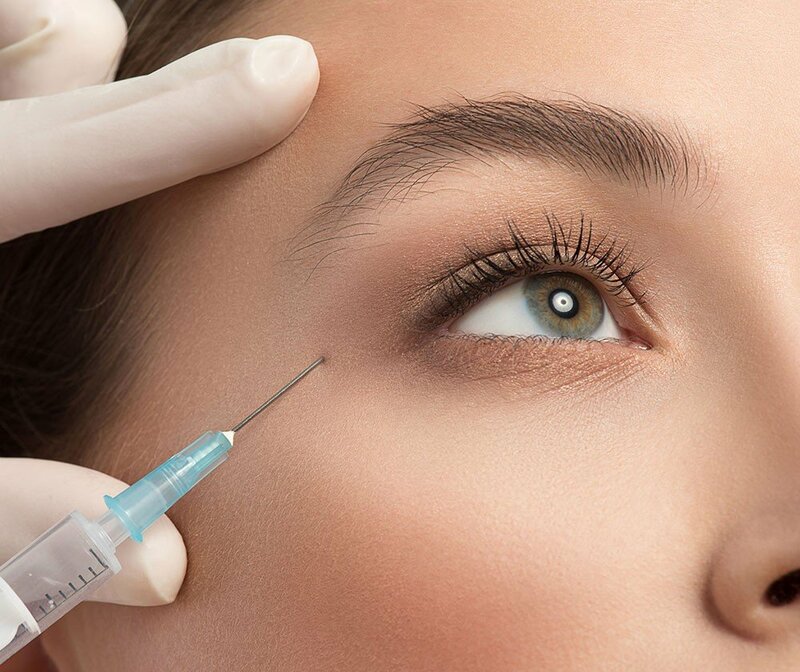 The injected Botox will take some time to come into action, but if the treated muscles are contracted often the effect of the Botox will kick in quickly, for example frowning a lot after injecting the frown muscles. The next day the effect will become noticeable but the total effect of Botox will be visible after one week. The wrinkles will become more superficial and the balance of forces on the surrounding structures will change. In this way, the position and shape of the eyebrow can be manipulated by paralyzing selective muscles. The effect of Botox will last 3 to 4 months, after which the muscles will recover completely. When Botox is continuously repeated the muscles will not be able to recuperate and the effect will become more permanent. After one week you are invited to evaluate the result should you feel the aimed result has not been achieved. Possible additional touch-up injections are included in the primary treatment. It is important that you achieve the maximum result and that you are content with the treatment. The use of Botox is effective in the hands of an experienced doctor and can produce attractive and natural results. Some people want more Botox than is necessary. As long as they fully understand the esthetic effect and specific aim of this then it is their personal choice. It is therefore most important that during the first consultation, the areas to be treated, the dosages and the effects thereof are clearly discussed. In some instances, it may be wise to start conservatively, review its effect after a week and add Botox if clearly desired. The injections with thin needles normally will give some localized redness and swelling that will subside within 30 minutes. A small bruise can develop if a small vessel at the injection site is pierced. This does not occur often and if it does a cold compress will contain it. Make-up can be applied until the bruise is resolved after a couple of days. The treatment of a horizontal wrinkle above the eyebrow can result in a droopy eyebrow. Therefore, in case of already low positioned eyebrows one must be cautious when treating forehead wrinkles. Very deep wrinkles i.e. frown wrinkles, will still be present after treatment because the skin in the wrinkle has become thinner due to years of frowning. This can be treated best by using a filler after Botox treatment. As a precaution, pregnant women will not be treated with Botox. About 1% to 2% of people have antibodies against botulinum toxin and Botox will therefore have little or no effect.